Perillo Tours Faith Journeys offers the opportunity for travelers to fulfill the richness of belief through hands-on experience. For more than 70 years, Perillo Tours has hosted thousands of believers on carefully crafted itineraries which offer a perfect blend of touring and exploring. In fact, Mr. Italy, Mario Perillo, met his wife in Rome during the Holy Year in 1950. She was on a Perillo tour! 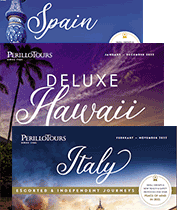 Perillo Tours Faith Journeys provides sojourns of the soul to Italy, Greece, Europe and The Holy Land. In the Perillo tradition, great care is taken in planning your program and ensuring that your group will enjoy an AUTHENTIC faith based immersion by visiting not only major cities, but also the small towns and villages where you will be welcomed with a warm smile and delectable local cuisine. Booking a Perillo Faith Journey is easy! Just answer a few basic questions and we will forward the perfect sample programs to suit your exact specifications.